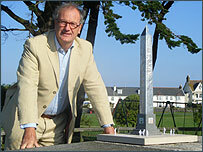 Plans to rebuild the 100 foot obelisk at Delancey Park have recently been submitted to the Environment Department. We spoke to local architect Andrew Dyke about the designs and the response so far. Andrew explained that it is still "early days" and it can take some time for plans like these to be considered. Although the Environment Department has not responded to the proposals yet, they did view the proposals informally before the submission was made and "we had a very positive response from them at that time," recalled Andrew. 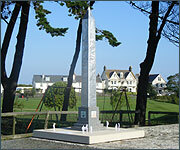 The original granite monument, built in 1878 to honour Admiral James de Saumarez, was destroyed in 1943 by the German occupying forces. One of the features of the design is a series of holes representing the milky way which would be lit up from within at night. The designers are working with lighting consultants to ensure that the "stars" would be visible from a distance. "On a starry night it will blend in with the sky, on a dark night it will shine forth". People concerned about light pollution do not need to worry as the stars will not cast a "great area of light". The proposal includes the use of low energy lighting, with the constellation stars being lit by LED lights which have a long life and are highly efficient. The base of the new design would be built from granite, like the original. "In fact, the whole thing - in terms of its size and shape - is exactly the same as the original monument," explained Andrew. The obelisk itself is built from a very shiny type of stainless steel called duplex which "doesn't stain, doesn't rust and it's a marvellous material, very strong, vandal resistant... also it's self-cleaning," said Andrew. Those behind the plans are hoping to fund the build through public subscriptions and donations, which was how the original monument was paid for.